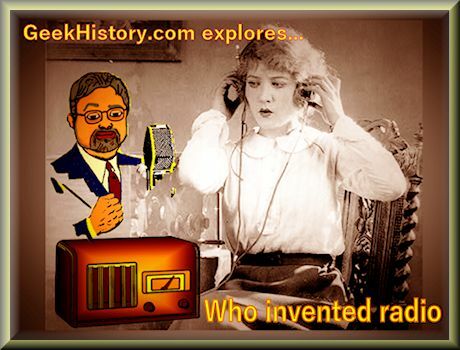 Answering the question of "who invented radio" is another example of the complexities of defining inventors of inventions. There is no one "eureka" moment where a lone inventor in a lab created something totally new that changed everything. Radio was an ongoing evolution of an idea over time. It is not as simple as picking out a single individual, or even a single point in time, that was the turning point in the creation of radio. I started my career in technology in the 1970s working on military communications and citizens band radios. As I studied technology I remember Guglielmo Marconi was often mentioned as the "father of radio." Over time I have come to realize that Marconi is one of many contributions to the technology of radio. What makes that task even more difficult with radio is that the term itself does not define a simple single item. When I say radio, do you think of music broadcast over the airwaves? When I say wireless do you think of voice communications? The concept of radio continues to evolve. In the early half of the 21st century the term wireless could be used to describe a short-range computer networking system, with technologies such as Wireless Local Area Network (WLAN), Wi-Fi, and Bluetooth. The term wireless is also applied to a mobile telephone system. The concept of radio started as the transmission of telegraph messages without connecting wires. The etymology of "radio" or "radiotelegraphy" reveals that it was called "wireless telegraphy" which was later shortened to "wireless." Michael Faraday is best known for his work regarding electricity and magnetism. Faraday began his great series of experiments in 1831 on the concepts of electromagnetic induction. James Clerk Maxwell introduced the concept of electromagnetic field in the 1860s. Based on the earlier experimental work of Faraday and other scientists and on his own modification to Ampere's law, James Clerk Maxwell developed his theory of electromagnetism, which predicted the existence of electromagnetic waves. Heinrich Rudolf Hertz conduct a series of experiments between 1886 and 1889 that validated Maxwell's theory. The unit of frequency, cycle per second, was named the "hertz" in his honor. Henry Ford created the ultimate geek history museum complex of the Industrial Revolution in Dearborn, Michigan, a suburb of Detroit. Collectively called "The Henry Ford" the history museum complex is comprised of the large indoor Henry Ford Museum, and the outdoor Greenfield Village. The museum complex also has an IMAX movie theatre and offers the Ford Rouge Factory Tour. In the Chicago Tribune in 1916 Henry Ford was quoted as saying that "history is more or less bunk." Ford qualified that remark by saying he was referring to written history which talked about wars and politicians, but the history taught in school did not record the history of the common man. By the late 1920s, Henry Ford had become the primary collector of Americana in the world. Ford started with collecting antiques and household goods, but he later moved on to collecting historic structures with the creation of Greenfield Village in Dearborn, Michigan. Ford also began collecting materials for a museum with a theme of practical technology. The Edison Institute opened in 1929 as a private site for educational purposes only, based on Henry Ford's desire to preserve items of historical significance and portray the Industrial Revolution. The Edison Institute Museum, now known as The Henry Ford Museum, is a traditional museum reflecting Henry Ford's love of farm tools, home appliances, furniture and industrial machines. There are also large exhibits of automotive and locomotive technology. Next door to the Henry Ford Museum is Greenfield Village, a vast array of famous homes and buildings that Henry Ford moved from their original location and reconstructed there. One of the most interesting analogies I have heard describing Greenfield Village is that Henry Ford collected buildings like some people collect stamps. The original purpose for Greenfield Village, from Henry Ford's point of view, was for educational purposes. He felt the best way for the country's youth to learn by experiencing things first-hand. Many of the first buildings at Greenfield Village were from the life of Henry Ford and Thomas Edison. Ford named it Greenfield Village, after his wife's hometown. Greenfield Village started with a loving restoration of Ford's boyhood home. When workmen recovered broken bits of his mother's dishes, Ford had her china reproduced and placed on the shelves just as it had been when he was growing up. He built a replica of the workbench where he had repaired watches as a boy, scoured antique shops to find furniture he remembered from his youth, and filled dresser drawers with shawls like those his mother had worn. The legacy of Henry Ford and his mark on the world of technology in the modern industrial era is significant. 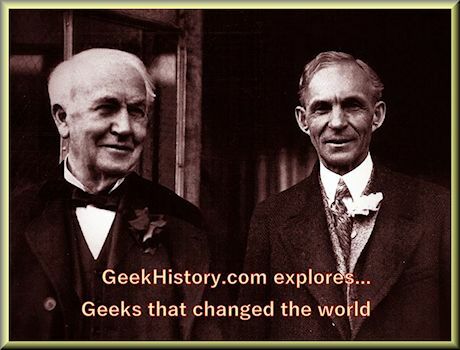 There are numerous debates in the realms of geek history as to what credit should be given to Henry Ford and Thomas Edison for various inventions. People point out that Edison did not invent the light bulb, he was simply a business man. Edison realized that experimentation and research takes money. Edison's first invention was the Universal Stock Ticker in 1869. Edison used the money he earned from the stock ticker to start his "invention factory." Edison paid workers to conduct numerous tedious experiments so he did not have to do the boring manual tasks himself. I think that is pretty genius. Remarks are made that Henry Ford was not an inventor, he was an industrialist that sold automobiles. While it is true that Henry Ford did not invent the automobile or the assembly line, he perfected the assembly line to create lower cost automobiles, and create an industry. During the modern industrial era from the mid 19th century to the early 20th the world was changing rapidly thanks in part to geeks like Thomas Edison and Henry Ford. Even if Henry Ford and Thomas Edison invented nothing their contributions to science and technology changed everything. The son of a Michigan farmer, Henry Ford was a childhood geek who loved tinkering with machinery. When Henry turned 16 years old his father William arranged for Henry to stay with an aunt in Detroit. Henry hoped to find work where he could learn more about machinery. For more than a decade Henry Ford worked in various shops perfecting his skills as a machinist. Henry began working at the Edison Illumination Company as a steam engineer in 1891. After his promotion to Chief Engineer in 1893, Ford had enough time and money to devote attention to his personal experiments on gasoline engines. Why was the internet created? Who invented world wide web?